Every time there's a mass casualty Islamist terror attack, the Western intelligentsia pops the same question. Shortly after the latest ISIS suicide bombers struck in Brussels on March 22, German Green Party MP Franziska Brantner tweeted "Why do they hate us so much?" The intelligentsia's ignorance perseveres in spite of the answer right in front of them: it's not hatred but an ideology called Islamism that compels violence. We are now almost 15 years beyond 9/11, and it's time to stop asking this question after every major jihadist attack. First, the obligatory disclaimer: "they" refers to Islamists and "we" to everyone else, including moderate Muslims (with all due respect to Donald Trump). 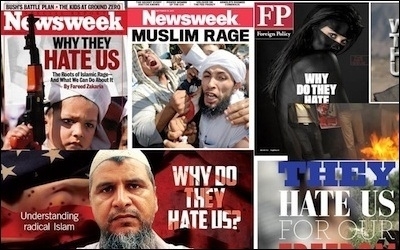 The self-indulgent introspection began in earnest on October 14, 2001, when Fareed Zakaria asked in Newsweek "Why Do They Hate Us?" Zakaria blamed the victim. US support of "Israel's iron-fisted rule over the occupied territories" and various other "oppressive police states" in the Arab world is the cause. Zakaria acknowledged briefly the "total failure of political institutions in the Arab world" but still blamed the U.S. for having "neglected to press any regime there to open up its society." That essay ends with the admonition that "We have no option but to get back into the nation-building business." It is ideology, not hatred, that compels Islamist violence. Several days later in LA Weekly John Powers concurred that American support for "brutal, undemocratic Middle Eastern regimes" is the root of the problem and concluded that "they hate us because we don't even know why they hate us." The question persisted throughout the next decade and returned with new vigor in 2015, a year that began and ended with ISIS attacks in Paris. On November 13, 2015, while the dead in the Bataclan concert hall and in the streets of Paris were still being counted, Bill Maher asked guests on his television show "why do they hate us?" (they blamed "the Bush Doctrine") before concluding that "we still don't know the answer." On December 7, 2015, Hisham Melhem asked the same question in Politico and found the answer in poor assimilation and rampant Islamophobia from San Bernardino to the banlieues of Paris. After the Brussels attacks Politico ran an unsigned op-ed titled "Why Do They Hate Us So Much?" bemoaning Europe's growing populism and nativism. Moustafa Bayoumi raised this question in The Nation, answering that "Only when we face up to our delusions and actions and stop torturing others into silence will we be able to keep ourselves out of darkness." The theological underpinnings of ISIS are found in four doctrines, all easily grasped. First, the Doctrine of Loyalty and Enmity prevails among Islamists whose dichotomous world view is comprised of Dar al-Islam and Dar al-Harb. Mark Sageman translates these two as the "Land of Islam" and the "Land of Conflict." Loyalty and a strict adherence to Sharia law are demanded of all who inhabit Dar al-Islam, while everyone else is the ultimate "other." Islamists consider the West to be Dar al-Harb. Second is the Doctrine of Offensive Jihad. Whether they are following Ibn Taymiyyah, Syed Abul Ala Maududi, Sayed Qutb, Abdus Salam Faraj, or Osama bin Laden himself, Islamists have internalized the doctrine of loyalty and enmity to the extent that they believe engaging in offensive jihad is the only way to remain faithful to Muhammad's example. Offensive jihad is often portrayed as a defensive jihad against ideological "attacks" emanating from Dar al-Harb. Islamists make a distinction between suicide and martyrdom in the service of Islam. Third is the Doctrine of Martyrdom. People misunderstand suicide terrorism by thinking that only hatred could cause someone to seek revenge in an act that requires his death. This in fact is wrong, for not only do Islamists from Hamas to Hezbollah and even bin Laden claim that they love death like we love life, but they also make a distinction between suicide, which is committed "out of depression and despair" according to Ayman al-Zawahiri, and martyrdom, which is carried out "to service Islam." The one thing witnesses remember about the Hezbollah suicide bomber who killed 141 Marines on October 23, 1983 is that he was smiling as he drove his truck into their compound in Beirut, Lebanon. When Palestinian suicide bombers detonate themselves, their comrades and families celebrate their wedding to dark-eyed virgins, not their hatred. Last is the Doctrine of Takfir, an Arabic term referring to the process whereby an Islamist accuses a moderate or heterodox Muslim of being insufficiently Islamic and therefore no longer worthy of the protection conferred by the doctrine of loyalty. Those so identified become just another enemy from Dar al-Harb. Only takfir, not hatred, can explain the preponderance of Muslims killed by Al-Qaeda and ISIS.